We love reading at Olde Creek! The Olde Creek Library is a warm and welcoming place for students, teachers, and parents. It is the goal of the library program to develop and encourage a love of reading for all students and to foster curious children who are learning to find answers to their own questions. Our library provides access to a large number of print and digital products for all of our students, K-12 and their families, to support research, learning, and recreational reading. Each class meets weekly with OC Librarian, Patty Smalley, for a library lesson and book check-out. Visit the Library page of this website for connections to online databases and libraries. All resources are free for students to use both at school and at home. Parents are always welcome in the library as volunteers for shelving and at the book fair. Contact Patty Smalley at pssmalley@fcps.edu if you are interested in volunteering. Specialized resources for all of your research needs. 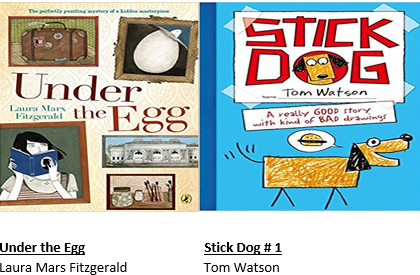 TumbleBookCloud - is an online collection of ebooks, enhanced novels, graphic novels, videos and audio books, which offers students and adults of all reading levels access to an amazing range of content. TumbleBookCloud Junior is an online collection of ebooks and read-along chapter books, non-fiction books, graphic novels, educational videos, and audio books! This database is a great option for adventurous young readers who wish to read beyond the picture book collection in the TumbleBookLibrary. It is designed specifically for kids in grades three to six. Tumble Books has over 1,000 titles including story books, read alongs, videos, nonfiction, math stories, puzzle games and more. See your teacher for username/password. Storyline Online features professional actors reading notable children's books. What is The Battle of the Books? It is a competition between Olde Creek 4th and 5th grade classes involving 8 books. Each class will have 3 participating representatives and one alternate representative. During the battle, questions about the selected books will be asked. The team that answers the most questions correctly wins the battle for their class! How can I represent my class? Read as many of the selected books as you can and take the Battle of the Books quiz. The 3 students scoring the highest on the quiz will represent their class. How can I participate if I am not my class rep? Students from each class may be called upon by their class representatives as a “phone-a-friend.” Even if you are not selected to represent your class, your knowledge of the selected books may help your class. Each class will create a class name, theme and a class chant. The chants will be presented by the whole class during the battle. Also, all students can dress to the theme selected by their class. Where can I get the books? Look for the special collection of Battle of the Books titles in the Olde Creek Library. Check one out today! Hey 4thand 5th Grade students! Which class will win the next Olde Creek Battle of the Books? The battle is a trivia contest. The more books you read, the more questions you can answer. The top 3 scorers on the quiz will represent their class in the battle! Check-off each book below as you read.